Conception vs Perception: Open Web and Open Hardware : Android Accelerometer controlled bot via WebSockets. 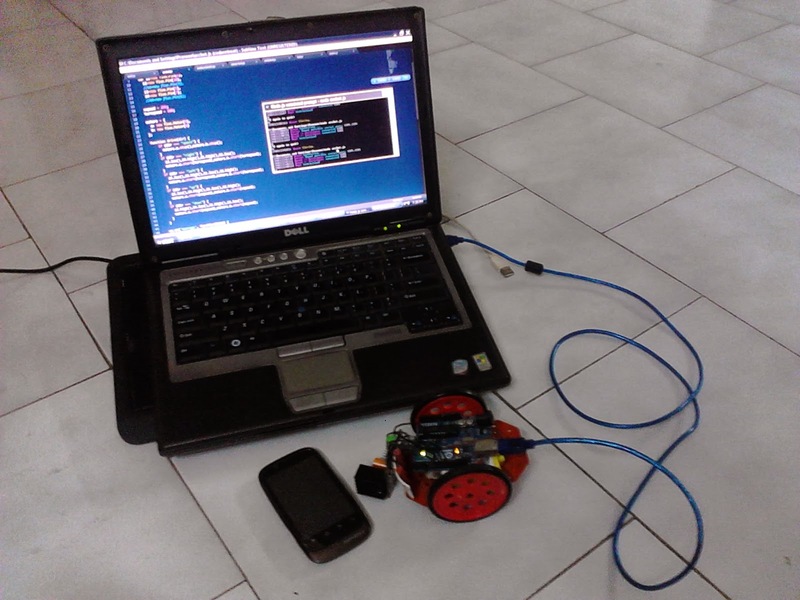 Open Web and Open Hardware : Android Accelerometer controlled bot via WebSockets. OK, so my Firefox OS device is with a friend of mine, and I want to control my bot with gestures. Thankfully I've got an (ageing) Android v2.3 phone. I am a web enthusiast. (So HTML5 / JS is in). I like Python because of its simplicity. Now combining all these points, I went ahead in search of suitable solutions, with the following constraints. Constraint 1 : Use Web Sockets for transfer of sensor data. Constraint 2 : Write as less code as possible. After going through the github code of the WebSocket for Python implementation, I found another beauty that saved the day completely! They had an Android example code for ws4py! With SL4A (Scripting Layer for Android) and Python for Android already installed on my phone, I just need to run the CherryPy Server on my machine, the example Client on my droid, and following the instructions, voila I now have the accelerometer values being streamed via websockets! All this without writing a single line of code! Now I just need to interface the arduino bot with the machine, and what better to achieve that than johnny-five? Alright, so, am I happy with the end result? Yes, to a certain extent. But being a web enthusiast, I want the entire stack to be JS. Yeah that's right, I'm looking right at you Firefox OS! Lots of features in mind! Let the journey of Open Web and Open Hardware Begin! Till then, watch this video of the bot in action! Firefox OS KeyboardIME : Up and Running!